Louisiana's wetlands are famously disappearing, thanks to a century of dredging and drilling in the Mississippi River. A football field-sized swath of land falls into the ocean every hour. But along on small part of the coastline, the land is actually growing. Welcome to Atchafalaya Bay. A pair of recent satellite images released by the NASA Earth Observatory shows Atchafalaya Bay in 1984 and 2014. A necklace of barely visible islands morphs into prominent chunks of land. The mouths of two rivers, the Atchafalaya and Wax Lake Outlet, grow substantial deltas. By one estimate, the deltas have added one square mile every year. The key reason is that the Atchafalaya delivers sediment to the coast at a pace that allows it to settle into shallow water and to maintain marshes. In contrast, an extensive series of levees keep the Lower Mississippi's water flowing in a narrow channel that whisks water and sediment past natural floodplains. 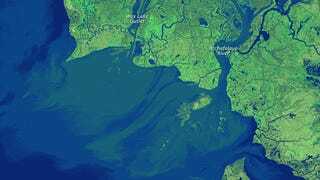 Instead of building new land along the mouth of the Mississippi, the controlled river sends jets of sediment-rich water directly into the relatively deep waters of the Gulf of Mexico and toward the edge of the continental shelf. Given the history of the Atchafalaya River, it's fitting to think of it and the Mississippi as twins with interlocking, if divergent, fates. The Atchafalaya is actually a distributary of the Mississippi, branching about 130 miles before it reaches the coast. Left to its natural devices, all of the Mississippi's water would eventually flow into the Atchafalaya over time. Water likes to take the easiest path to the sea, and Atchafalaya offers the shorter path. River are dynamic this way. The Mississippi has changed course countless times in history.